Supplied in 1 litre cartridges, for use in many soap dispensers, or 5 Litre containers. Quick acting and highly effective alcohol based disinfectant kills bacteria and viruses. Contains an effective moisturiser to leave hands smooth and dry. Handy, hygienic 500ml pump dispenser unit or bulk 5 Litre container also with pump. RHP 8562: Luxury fragranced skin cleanser for use in most commercial applications. Contains skin emolients and is Ph balanced for mild gentle cleansing. 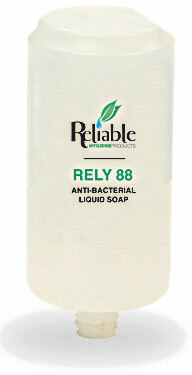 RHP 8564: Unfragranced anti-bacterial skin cleanser containing a proven biocide, Irgasan DP300. Contains skin emolients and is ph-balanced for effective gentle cleansing in hygiene sensitive areas such as food processing applications. 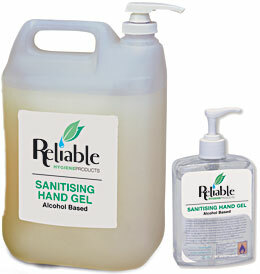 RHP 8566: Sanitising hand gel. Alcohol based. Rapid action, highly effective, moisturising, non tainting, no need to rinse with water. Prevents cross-contamination and the spread of bacteria in hygiene critical environments such as medical or food processing applications. RHP 8568: Unfragranced and non-tainting for universal skin protection. For use in both wet and dry work situations. Regular use helps protect and moisturise the skin. RHP 8569: A pleasantly fragranced, ph-balanced all-over body wash lotion. Creates a mild, yet rich cleansing lather. Ideal for most areas of commerce, care and industry. Hygienic soap dispensing unit for above. Versatil e and effective fluid cleaner for vehicles. Applied manually or with a steam cleaner.